Happy new year, everybody! I hope you are excited to tackle 2018. I know I am. Malfunction by J.E. Purrazzi - an action-packed cyberpunk novel that is currently blowing me away. It’s everything I like: Indie published, creative, hard-hitting, and well-written. You should read it. The Idiot by Fyodor Dostoevsky - this month on "Hannah is obsessed with Dostoevsky" I give you an amazing story about a man who’s so kind that people think he’s mentally ill. Sounds weird, right? It’s actually quite good and very thought provoking. A Silent Voice by Yoshitoki Oima Vol 1 - a manga about a young teen who bullies a deaf classmate so much that she leaves their school. Years later he’s haunted by his mistakes and wants to make amends, but doesn’t quite know how. I’ve only read vol 1 at this point, but was really excited by the character development and artwork, so I’ll be reading the whole series this year. Inhumans #1 by Paul Jenkins - I couldn’t bring myself to watch the Inhumans TV series, so I turned to the comics and was pleasantly surprised by the beautiful writing style employed in this comic. Adding this to my list of series I will complete this year. If you have questions about the age appropriateness of any of these books, feel free to get in touch with me. I'd be more than happy to give a brief overview. 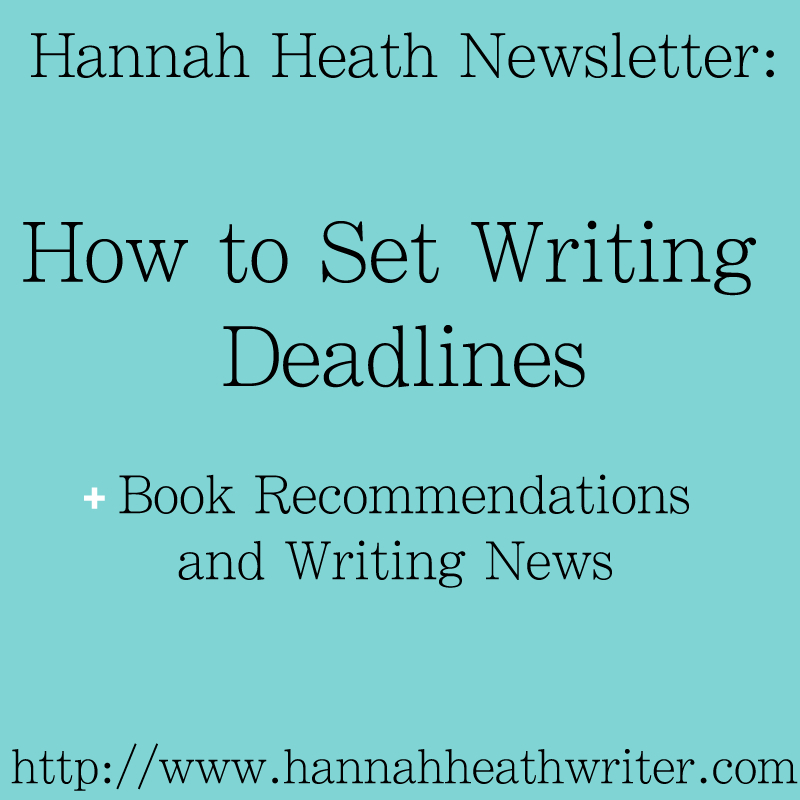 Writing Tip of the Month: Set Writing Deadlines. Here’s how. As a creative, got-no-strings-on-me, hippy type of person, deadlines weren’t really something I’d ever considered setting on purpose. They just…happened. I have a weekly deadline for my blog posts. A monthly deadline for my Youtube channel. Deadlines for WriteOnCon work. I didn’t notice I’d set them up until they were entrenched in my brain. By the time I finally took notice of them, I realized: These deadline things are actually really helpful. So I decided to try it for my daily writing life. I set a deadline for my completion of The Stump of the Terebinth Tree, a project that I couldn’t ever seem to complete. And you know what? I finished it two days before my deadline. I set a deadline for the first short story in the Terebinth Tree Chronicles and I’m on target to finish that in time rather than completing it two days before the set release date (because yes, that’s the type of thing I do….It’s hard being me). 1. Be realistic. But also harsh. You need your deadlines to take everything into account: How much time you have, how fast of a writer you are, what your day job is like, etc. Don’t overburden yourself. But then again…do put yourself under some pressure. You want your goal to be attainable, but also rigorous enough to force yourself into being structured about your writing process. 2. Schedule your writing time. Yep. I’m harping on this again. Schedule a time to write each day/every other day/week/whatever-you-can-pull-off and stick with it. This is really, really important. 3. Keep track. Set a goal and then figure out what you have to do each day to meet it. How many words do you have to write? How much time do you have to carve out? Do the math and then stick to the numbers. 4. Reward yourself. Every day that you stay on track, give yourself a little treat. Me? I chose to allow myself to watch Netflix a bit each night if I wrote that day. Yes, that means I didn’t get to watch anything if I didn’t write, so it was also a bit of a punishment. But it worked. As scary and non-creative as deadlines seem, they are necessary if you want to make healthy progress in your writing life. So here’s my challenge to you this month: Pick a writing project. Give it a deadline. Even if it’s just: "I’ll complete three chapters this week." Now stick to it. Go on. Confront the problem. Fight! Win! And get in touch with me when you complete it. I’d love to hear how it goes. I announced the Terebinth Tree Chronicles series. You can read about that here. Phoenix Fiction Writers released on 12/22. Phoenix Fiction Writers (which I will from now on abbreviate as PFW because it’s shorter…also, I can’t ever spell ‘phoenix’ correctly on my first try. Shhhh. Don’t tell anyone) is an indie marketing collective with all sorts of amazing things going on. We’re writing book reviews, short stories, blog posts. We’re marketing each others indie publications. We’re podcasting. In short: We’re being awesome. Stop by and say hello sometime. We’ll introduce you to your next favorite book. I finished up yet another semester of science. I am now an expert in BioChem, Genetics, and Molecular Biology. Kind of. I’m not really sure how most of this pertains to being a Nutrition major, but it definitely helps with being a speculative fiction writer. Sci-fi, here I come! I failed my Goodreads goal. Apparently trying to read 200 books in a year is too much. Who knew? I reached about 125, though, so that’s halfway decent. How many did you read? Is it good? I don’t know. I kind of like it, though. What do you think? I’ll be wrapping up the podcast interviews for WriteOnCon. Because yes, as the Live Events Coordinator I’ve been interviewing authors and literary agents and other business professionals for short 30-minute podcasts. All of these will be released during the WriteOnCon event, so go buy a ticket. These podcasts are goldmines of information and I cannot even begin to tell you how helpful they are. Book deals? Querying process? Writing neurodiverse characters? Sticking to writing goals? Secrets to indie publishing? These topics and more are all covered in various podcasts.…And will also be discussed during our live events. It’s amazing. Anyway. I’m recording my last podcast interviews this month and will be sad to see them go. They’ve been fun. I’m going to the Anime Los Angeles con. Which, oddly, is held in Ontario, Ca. Not LA...? I don’t know why. But it doesn’t really matter because I have my Constant Collectible press pass and am all set to check out the amazingness this con has to offer. I’m hoping to discover some indie published manga in Artist Alley, but we’ll see. If you’re going to Anime Los Angeles, please let me know! I’d love to meet up with you! PFW will release our first podcast. I’m not sure if the people involved or the topic we’re discussing has been officially announced yet, so I won’t give any details. All I’ll say is: It’s going to be great. Subscribe to our channel to listen in. I’ll be releasing information about The Terebinth Tree Chronicles. Like the title. The synopsis. The cover. So keep your eyes glued to my blog. What are you up to this January? Have you made any awesome New Years resolutions that you probably won’t keep? What? Just keeping it real. I’d love to hear about your recent comings and goings, so feel free to leave a comment. I’ll talk to you again in February!